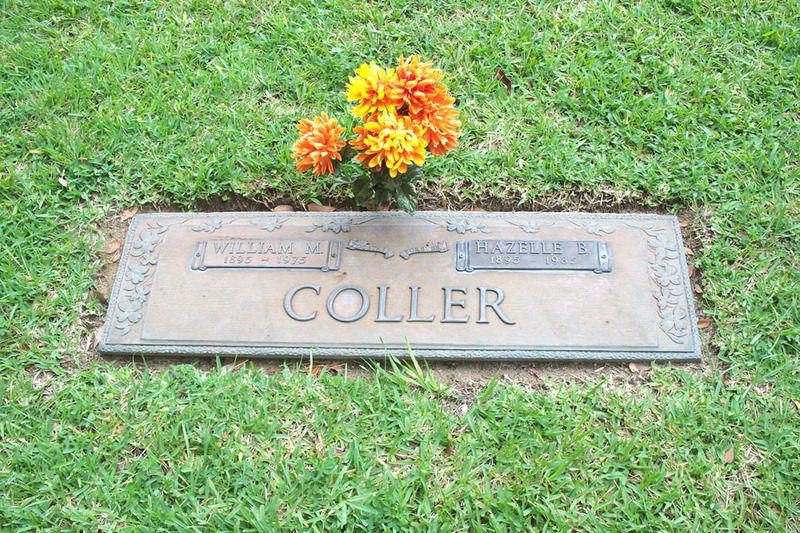 William McKinley Coller was also called "Bill". Business Name of Employer: Periodical Publishers Bureau, Inc.
William McKinley Coller's death certificate states that he died at Monroe Memorial Hospital located in Ocala, Marion County, Florida on November 7, 1975. The cause of death was chronic pulmonary emphazema. He was survived by his wife, Hazelle Nelson, and they lived at 315 S.E. 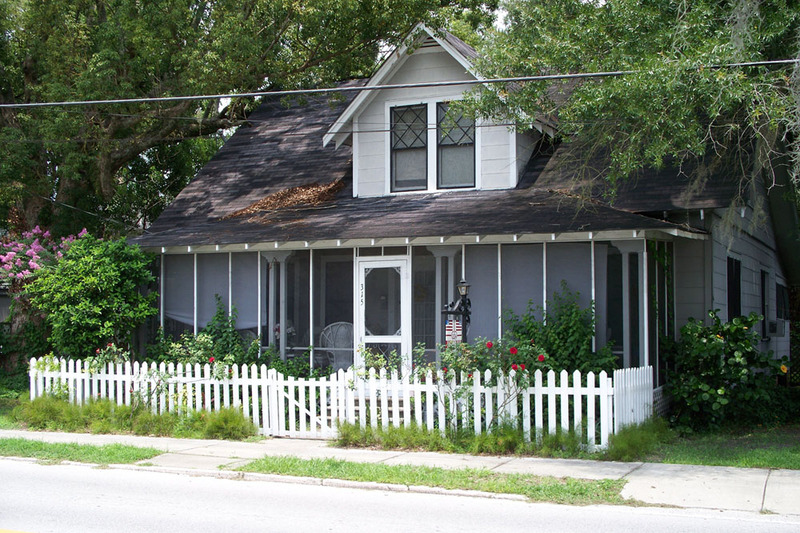 Watula Avenue, Ocala, Marion County, Florida. He was buried in Highland Memorial Park on November 12, 1975. The funeral home was Hiers Funeral Home. He was a retired insurance broker. Karen Coller Curell remembers Bill as being tall and slender and working in the insurance business. 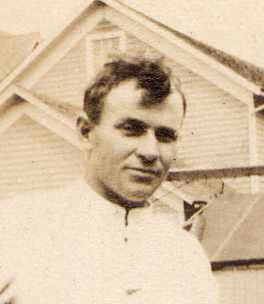 He was probably born in the woodshed behind the farmhouse of his parent's Sanilac County farm. So glad to hear from you. I used to live with your grandfather and his wife, Hazelle, in the early 1940s while I was a student at Owosso (MI) High School. I always loved him. He was such a nice man. And he had a high regard for me, too, I know, even though he nicknamed me "Wild Bill" because I did every errand so speedily!! I helped Hazelle check her students' papers every night, ran errands to the store, and helped clean house every Saturday morning before I went home for the weekend. Was paid $1.00 plus my room and board for that. And I was glad to get it!! One other important job was for me to help Billy find his pipe almost daily. He'd drop it down and forget where it was. Billy and Hazelle lived in three different houses in this area. I lived with them in two. The first was a rented apartment only a block from the high school where Hazelle taught. The second was a duplex home they bought just half a block away from that apartment building, so it was still within walking distance for her. After I went on to college, another girl lived with them, as I had done. She and Billy convinced Hazelle to sell the duplex and buy a brick farm house plus acreage north of town. Hazelle had to ride to school on the same bus as the school kids. She hated that fact.. They bought the place the same year my husband and I bought ours. Billy laughingly offered to sell the house to us for the price they had paid. Of course, having just gone into debt for this one, we turned down the offer. We didn't have enough money coming in to make the payments on that one, I'm sure. And, yes, all of the places are still here and lived in. The farm house has been altered--- the large porch has been torn off. Marcella had Bill's family Bible and many pictures. 2. Residence: 1422 Richfield Road, Flint, Michigan, 1918-1924. Source is address and postmark on mail. 3. Place: This map shows Snover, Michigan. The birthplace of William McKinley Coller. 4. Occupation, 1917, Buick Plant, Flint, Michigan. 5. Cemetery: Highland Memorial Cemetery: Ocala, Marion County, Florida. 6. 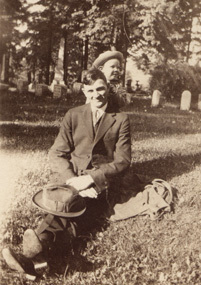 Picture: William and Eldon Coller, 1922. 7. Residence, 1946, Owosso, Michigan. This information was in his mother's 1946 obituary (Ada Mary Caines Coller). 8. 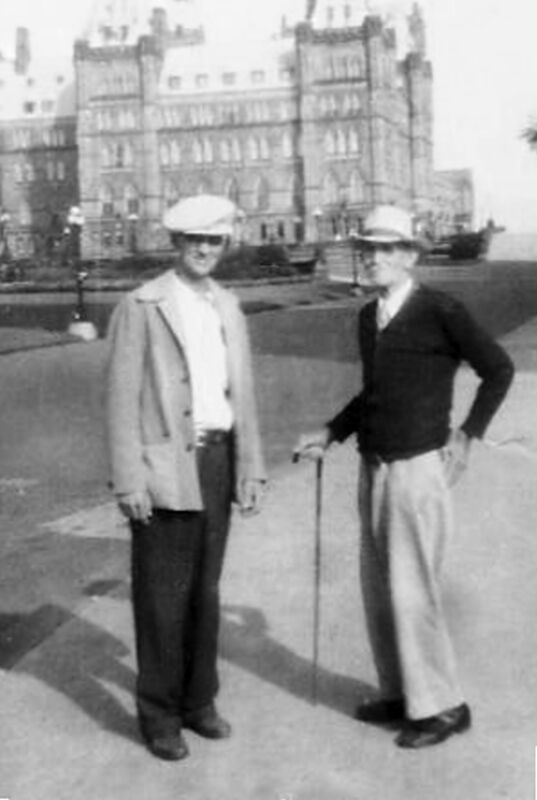 Picture: Bill and his father William Ellsworth Coller: Parliament Hill, Ottawa, Canada.